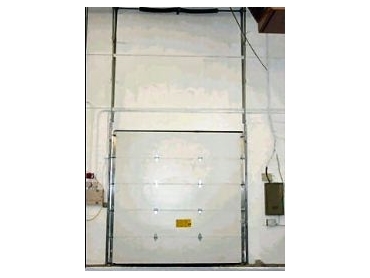 THE Insul-Rite 5255 sectional dock door is a simple, straightforward 2" thick insulated door for superior environmental separation. Its two-coat, baked-on polyester finish makes the surface virtually maintenance free, while the solid polyurethane core, with an R-value of 14.8, provides maximum thermal efficiency. The 5255 is ideal in cold storage environments. A thermal break separates inner and outer skins so virtually no heat or cold is conducted through section. Joint seal and bulb-shaped bottom seal are standard to help prevent air infiltration and reduce energy costs. Available through Red Australia in sizes up to 26' wide x 20' high to accommodate a wide variety of openings, the door meets or exceeds 15.2 psf windload per ANSI/DASMA 102-1996 standards in accordance with ASTM E-330-70. Rugged construction with a foam-in-place panel construction with galvanised steel facing offers long-term durability.